Fiber optics transmission – both short haul within a Data Center (DC) and long haul for WAN transport- have made great progress in recent years. While it took 12 to 14 years (from 2000 to 2012-2014) to go from 1G to 10G Ethernet in the DC, it’s taken only a couple of years to go to 40G in mega DCs and in the core WAN. Some DCs, Internet Exchanges, and WAN backbones now support 100G. During a March 9th Open Compute Project (OCP) Summit Keynote, Peter Winzer, Ph.D & Head of the Optical Transmissions Systems & Networks Research Department at (now Nokia) Bell Labs shared insights around how innovation has evolved along with the fiber optic foundation for telecom infrastructure and long haul transport. After his 11 minute presentation, Winzer was interviewed by Katharine Schmidtke, PhD & Head of Optical Network Strategy at Facebook (see Q&A summary below). Winzer shared key insights about how the “Transistor” was developed at Bell Labs (patent in 1947) and then given away for free to stimulate its uptake in design of electronic devices. That so called “culture of openness” spread to the area now known as Silicon Valley, ever since William Shockley set up his Mt View, CA lab in 1956, followed by Bob Noyce & company leaving to found Fairchild in 1957. “Silicon Valley is a spin-out of Bell Labs…” he said. We agree! Peter covered the glory days of Bell Labs to it’s accomplishments after divestiture by AT&T (to Lucent than Alcatel-Lucent and now Nokia) with a chart showing all the important discoveries. Please refer to this chart of Innovation at Work which continues with a video window of Peter’s speaking. Peter than described some of the more recent work he and his team conducted around the 100G field trial with Verizon in 2007 on a live link in Florida, which proved that capacity limits of optical networks could be drastically increased (from 10G or 40G to 100G) to help meet exponential growth in traffic. Winzer maintains that 100G in the WAN is feasible today as an upgrade to 10G/40G long haul networks. 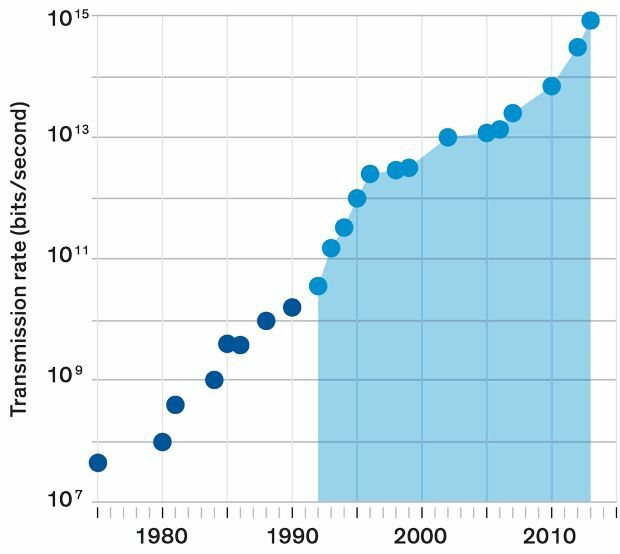 Please refer to chart of Making 100G a Reality- A Recent Example of Bell Labs Innovation. One little Bell Labs developed DSP chip does all the signal processing for 100G transmission. Next was a Terabit per second per fiber optic wavelength/channel (which assumes DWDM transmission) lab demo in 2015. Why was that important? Because data/video traffic is continuing to grow (exponentially). Traffic growth vs fiber speed per wavelength was illustrated by a table showing how much capacity/speed is needed depending on traffic growth rates. For example, with a 40% traffic growth rate, in 7 years a 10X fiber channel increase will be needed. That in turn implies 1 terabit per second transmission will be needed in 2017, since 100G bit/spec was commercially available (but rarely deployed) in 2010. It was always believed that fiber capacity was infinite. But it’s been slowing down since 2000. Looking ahead, the Bell Labs team will focus on facing challenges around fiber capacity limits as we are now approahing the Shannon limits of a fiber optic channel based on transmission distance. This topic was picked up again during the Q&A conversation described below. Dr. Schmidtke has been previously profiled in a 2015 Hot Interconnects article detailing Facebook’s (FB’s) intra DC optical network strategy. Katharine said that while most of FB’s DC internal interconnects were at 40G bit/sec links, one FB DC would be upgraded to 100G bit/sec using Duplex Single Mode Fiber (SMF) this year. SMF, while more expensive than Multi Mode Fiber (MMF), can be upgraded to support much higher speeds such as 400G bit/sec and even 1 Tera bit/sec. Katharine said that all FB DC internal interconnects would be upgraded 100G by January of 2017. Finally, Katharine said that it’s now possible to build efficient green infrastructure for better designed DCs. Note: Katharine didn’t talk about fiber speeds needed to interconnect FB’s DCs, e.g. their internal WAN backbone (note that Google refused to answer that very same question from this author during several of their talks on Google’s inter-DC fiber optic based backbone WAN. 1. What’s the capacity needed in the near future? Fiber optic capacity is very relative, dependent on operator demand and their traffic growth rates. 2. What should the industry be doing to address the capacity challenges? There are five physical dimensions that can be used to scale a network. Only Frequency and Space haven’t been exploited yet, but those will need to be researched. Several approaches were suggested for Frequency improvements. Space implies parallel transmission systems (TBD). 3. How does coherence technology (e.g. 100G Coherent DSP chip from Bell Labs) help on the network scale? With Coherent DSPs you can electronically compensate for various types of impairments such that 100G becomes a “piece of cake” where 10G previously had trouble (due to uncompensated fiber impairments). You can also monitor and open up the network to sense polarization rotation in the signal which could be caused by a back hoe digging up the system. That’s predictive fault detection and isolation. Please also see the IEEE Spectrum article excerpt on coherence below. 4. What about “Alien Wavelengths” (sending wavelengths generated by a different vendor over the fiber line system built by the incumbent vendor)? Coherent technology can compensate for impairments much more easily providing for a lot more openness. 5. Business case? Peter referenced Bell Labs giving away the transistor to stimulate electronic designs to use it. The effect was that the transistor began used for switching (and other applications) besides the linear amplifier it was originally intended to replace. It had a huge impact on the electronics industry. The implication here is that openness and collaboration as per the OCP will lead to important innovations in fiber optics transmission. Time will tell. In a March 9th afternoon OCP Summit session, Katharine described Optical Interconnects within the DC and Beyond using FB DC’s as examples. That was then followed by a panel that included representatives from Microsoft, Google and Equinix. You can watch that video here. Has Fiber Optic Transmission Speed Reached It’s Limits? The article also defines coherence and why it’s an important and intrinsic property of laser light. Space and time do not permit any more discussion here about the intriguing subject of how to increase fiber optic tranmission capacity as the Shannon limit is reached. The obvious answer is to just use more fibers or wavelengths. We invite blog posts, referenced articles and comments (log in using your IEEE web account credentials to post a comment below this article).